Etisalat easyblaze is the brand name for Etisalat’s 3G Internet data services in Nigeria. It offers super fast internet that will make broadband services possible and hassle free. Etisalat easyblaze offers high-speed internet, hassle free video streaming, super fast downloads, Web TV and more. Discover Etisalat easyblaze data plans in Nigeria on this page. See Etisalat easyblaze speed test. Etisalat easyblaze is not automatic. You have to be in a 3G coverage area to access Etisalat easyblaze. Etisalat easynet is available on GPRS/EDGE coverage areas. To access internet using the Etisalat high speed HSPA+ 3G network, you have to specifically activate an easyblaze data plan using an appropriate access code. You do not require a new SIM or a SIM swap. If you are currently browsing on Etisalat EDGE, you can also browse on Etisalat 3G, but you must first activate an Etisalat data plan. To activate Etisalat data plans load the recharge value for the package you wish to activate and then either use the appropriate USSD command or SMS the appropriate code for the package to 229. Recharge bonus may also be included to your data allocation. Etisalat easyblaze 3G supports auto-renewal. So, if you have enough credit on your device to renew your current data plan, the data plan will automatically be renewed. The major advantage is that if you were not able to use up your data allowance within the validity period of your existing easyblaze subscription, the unused data will be rolled over to your new subscription. For example, if you subscribed for the 1.5GB package and have 0.2GB left after 30 days, on auto renewal you will have 1.7GB. However, if you allow your subscription to expire before re-subscribing any unused data allowance will be lost. 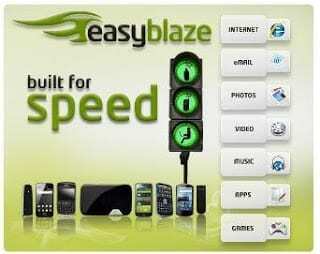 Etisalat easyblaze can be accessed by any 3G WCDMA/HSPA/HSPA+ enabled device: mobile phones, tablets, modems, routers, etc. Note however, that the speed you get is limited by the technology on your device. No need considering easyblaze if you are using a GPRS/EDGE enabled device. Etisalat easyblaze is currently available in 14 cities namely Lagos, Abuja, Port Harcourt, Ibadan, Kano, Kaduna, Zaria, Warri, Enugu, Aba, Awka, Nnewi, Onitsha and Benin. Etisalat promises to cover more towns and cities in the next six months. Note however, that 3G coverage may not be available in all locations in the stated towns and cities. Etisalat easyblaze is based on HSPA+ (evolved High Speed Packet Access) wireless broadband technology. HSPA+ is an evolution of the 3.5G technology HSPA (a combination of HSDPA and HSUPA). HSPA+, although marketed by some networks as a 4G technology, is a 3.75G technology and competes with other pre-4G technologies like LTE and mobile WiMax. HSPA+ offers data rates of up to 84 Mbps in the downlink and 22 Mbps in the uplink. However, Nokia Siemens network is testing a new HSPA+ technology that will offer data speeds of up to 336 Mbps. Etisalat easyblaze offers data speeds of up to 42Mbps. Note that this figure will not be achieved in practice. The speed you experience depends on the device you are using, the 3G signal strength in your area and a number of other factors. So, expect actual speeds of between 1Mbps and 5Mbps. Share your personal speed figures on the comment form. For more information about Etisalat easyblaze, visit Etisalat website at www.etisalat.com.ng.